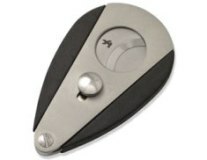 The V cutter creates a wedge-shaped cut in the cigars cap with a simple squeezing motion. The V-cutter allows proper air circulation to occur for a more pleasant smoking experience. The smokes tar and residue accumulate on the sides of the wedge keeping the bitter taste away from the smoker's mouth. One drawback is that the unique design and shape of this cutter make keeping the blades sharp more difficult. Pros: Great for smaller cigars and provides more smoking surface than the punch. Cons: Will need a good-quality V-Cutter for the cleanest cut.